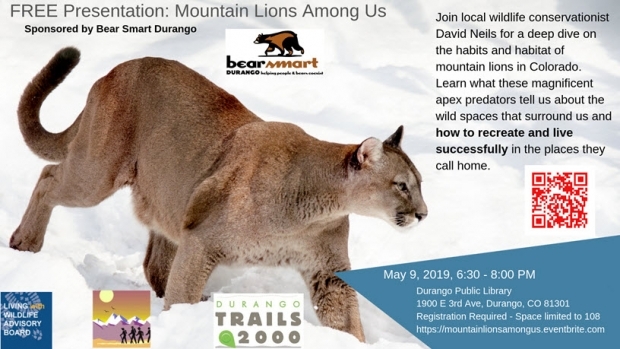 Bear Smart Durango presents the talk “Mountain Lions Among Us” by Colorado-based wildlife conservationist David Neils with Wild Nature Media on May 9th from 6:30 – 8:00 PM at the Durango Public Library, 1900 E 3rd Ave.
Workshop: There will be a mountain lion workshop the following day, May 10th, where participants will learn firsthand how mountain lions hunt and navigate in the Durango area. Space is limited! For more information and to register, go here. Thank you to Trails 2000, Seniors Outdoors! and the Living With Wildlife Advisory Board of La Plata County for co-hosting this event.